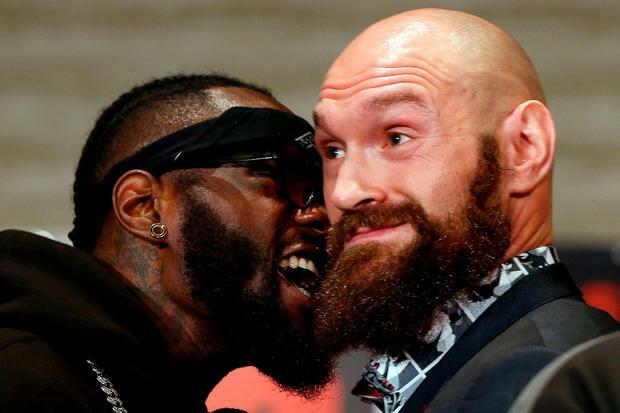 Tyson Fury and Deontay Wilder’s final press conference had to be abandoned on Wednesday afternoon in Los Angeles, as their rival entourages came to blows on stage. At a lengthy final news conference ahead of their heavyweight world title fight at the Staples Centre on Saturday, tensions boiled over when the two boxers were brought together for a face-off. A visibly infuriated Wilder began screaming obscenities into Fury’s face, and even accused Frank Warren of pushing him, before appearing to accidentally poke the lineal champion in the eye. That resulted in Fury pushing his rival, leading to the former's brother, Shane, making his way onto the stage on crutches to escalate the argument. Fury removed his shirt as security intervened, as numerous security guards struggled to regain control of the situation before the stage was eventually cleared. The brawl was an eyebrow-raising end to an otherwise fairly good-natured press conference, during which both men acknowledged how they needed the other boxer to help advance their respective legacies. Fury meanwhile poked fun at Wilder’s late route into the sport. “He tried to make it in American football and basketball, but he was not good enough,’ he said, to laughs from the crowd, before appearing to suddenly invent an unlikely talent for basketball himself. Fury was also keen to revisit his famous victory over Wladimir Klitschko — which happened three years ago today. “It is three years since I went to Dusseldorf and kicked Klitschko's arse all over the place," he said.